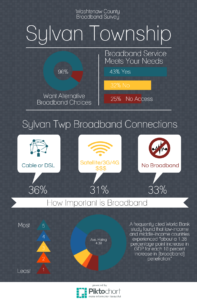 Sylvan Township residents responded to a survey conducted by Washtenaw Broadband initiative. Here are some of the findings. 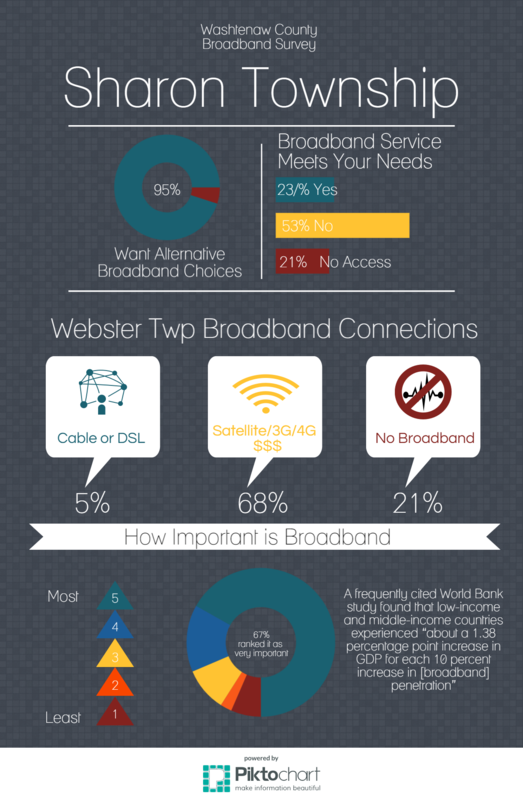 Sharon Township residents responded to a survey conducted by Washtenaw Broadband initiative. Here are some of the findings. 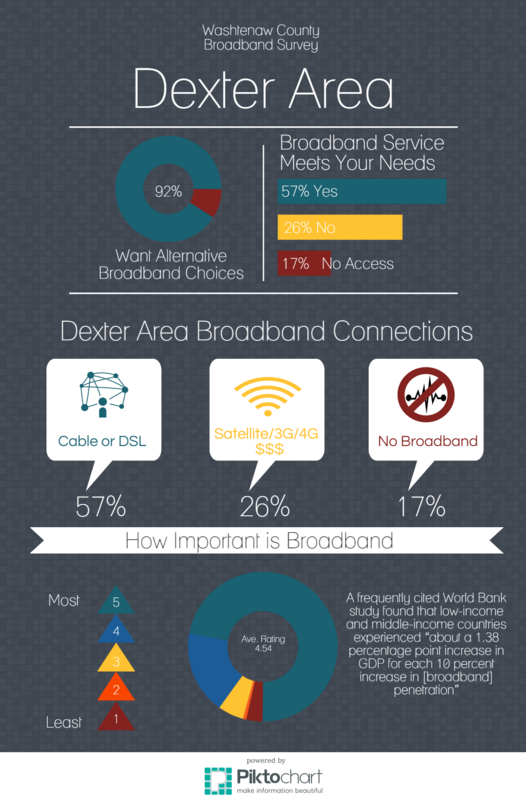 Dexter Township residents responded to a survey conducted by Washtenaw Broadband initiative. Here are some of the findings. Webster Township residents responded to a survey conducted by Washtenaw Broadband initiative. Here are some of the findings. Please find the feasibility study for Lyndon Township below. This study may be updated as we receive new information. Working with Dexter and Webster Township on their own feasibility studies. Drafting our first giving letter. Applied for a Washtenaw County Economic Development grant for $10,000 - Did not receive grant. Following the successful completion of a feasibility study for a township-wide fiber optic network, Lyndon Township is moving forward to seek community input on the project. Based upon the outcomes noted above, the evaluation committee has recommended that the millage issue be deferred from the original target of the August 2nd election. The Michigan Broadband Cooperative, a grass-roots community group, will host a town hall meeting on June 13th at 7pm, at the Washington Street Education Center auditorium to seek community input. Lyndon Township, like many townships in Western Washtenaw County, is significantly underserved in regard to broadband internet access. This can come as a surprise to residents from other areas that are well served by broadband – given how important broadband is for participation in modern society. It is hard to understand how significant parts of the region can be without it. Lyndon Township and the surrounding areas are lacking broadband coverage from existing cable and DSL providers, due to population densities that are too low to support the return on investment rates that these companies require. These providers have indicated that they have no plans to expand coverage into the unserved areas of Western Washtenaw County. In response, residents without adequate/affordable broadband service have come together and formed a non-profit organization called the Michigan Broadband Cooperative to build and operate community-controlled broadband infrastructure. This cooperative will work with municipalities to build a high-speed fiber optic to the home network that can provide next-generation broadband access to all residents. This initiative will operate as an open access network, over which private internet service providers can compete to provide service on a level playing field. It is part of the Michigan Broadband Cooperative’s mission to demonstrate the viability of providing equal access to high speed broadband services and create equal opportunity to students, workers, and businesses irrespective of where they choose to locate. Further, the Michigan Broadband Cooperative seeks to develop a model that can be scaled for other communities and ultimately to light up all unserved areas of Michigan with high speed broadband access that will wipe out the homework gap for students of all ages and catalyze economic expansion. The recently completed feasibility study paid for by Lyndon Township provides in-depth information regarding the estimated costs and revenues associated with building a fiber-to-the-home network in Lyndon Township, and shows the long term viability of such a project. The evaluation committee identified a number of decision points affecting the financial model that require input from the community. “We felt that we were getting into areas where we would be making sweeping decisions that would affect our neighbors – so we decided that we shouldn’t rush into things, and instead take the time to have conversations and do the research to get it right,” said Gary Munce, long time Lyndon Township resident and a Director of the Michigan Broadband Cooperative. The Cooperative is taking this next step in facilitating a community dialogue by hosting a town hall meeting on June 13th at 7pm at the Washington Education Center auditorium. This Lyndon Township effort follows similar successful municipal and grass roots broadband efforts from around the country, including a recently completed fiber-to-the-home project in Sebewaing, Michigan – the state’s first “Gigabit Village”. Each Sebewaing household now has access to connection speeds of up to one gigabit per second, as well as standard broadband speeds that are more affordable and reliable than comparable cable broadband offerings. 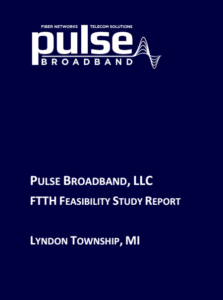 LYNDON TOWNSHIP, Michigan – March 23rd, 2016 – Following strong support from residents, the Lyndon Township Board has approved funding for a feasibility study to explore construction of a fiber optic network to provide township-wide access to broadband internet. 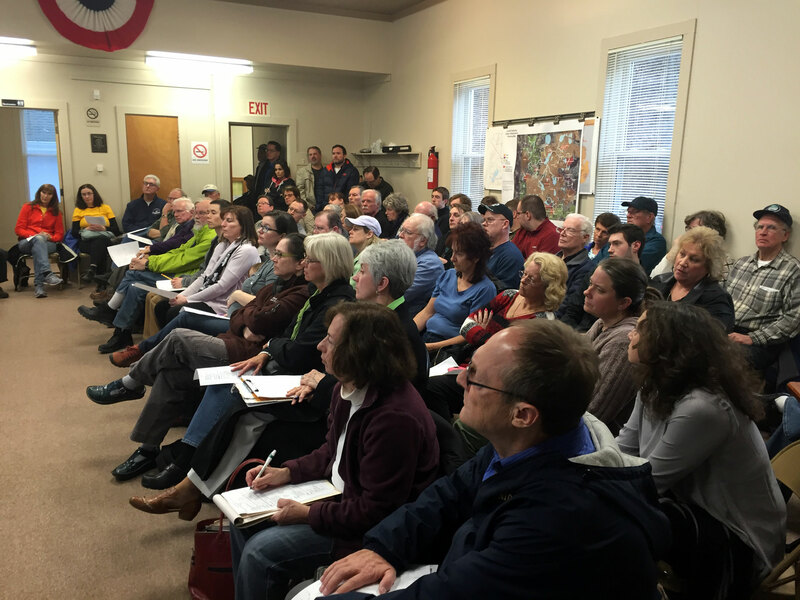 At the March 22nd meeting of the Lyndon Township Board, over seventy enthusiastic township residents came to voice their support for the feasibility study proposal, which was then approved unanimously by the Board. Lyndon Township and the surrounding areas are lacking broadband coverage from incumbent cable and DSL due to population densities that are too low to support the return on investment rates that these companies require. These providers have indicated that they have no plans to expand coverage into the unserved areas of Western Washtenaw County. In response, residents without broadband service have come together and formed a non-profit organization called the Michigan Broadband Cooperative to build and operate community-controlled broadband infrastructure. This cooperative will work with municipalities to build a high-speed fiber optic to the home network that can provide next-generation broadband access to all residents. This initiative will operate as an open access network, over which private internet service providers can compete to provide service on a level playing field. The feasibility study that the Lyndon Township Board has approved will provide in-depth information regarding the estimated costs and revenues associated with building a fiber-to-the-home network in Lyndon Township. Based on the results of this study, Lyndon Township and the Michigan Broadband Cooperative will pursue funding options to build the network, which may include private investors, grants, municipal bonding and a millage initiative. This Lyndon Township effort follows similar successful municipal and grass roots broadband efforts from around the country, including a recently completed fiber-to-the-home project in Sebawing, Michigan – the state’s first “Gigabit Village”. Each Sebawing household now has access to connection speeds of up to one gigabit per second, as well as standard broadband speeds that are more affordable and reliable than comparable cable broadband offerings. Additionally, Laketown Township in Allegan County on the west side of the state has successfully completed a fiber to the home feasibility study and is moving ahead with a millage initiative on their May ballot to fund the project. The Michigan Broadband Cooperative is a grass roots, non-profit organization with the mission of building open access, community controlled broadband infrastructure for unserved and underserved areas of Michigan. Formed in March of 2015, the Michigan Broadband Cooperative is governed by a volunteer board of eight Washtenaw and Jackson County residents. To date, over one hundred and fifty individuals have joined in the Michigan Broadband Cooperative’s mission.